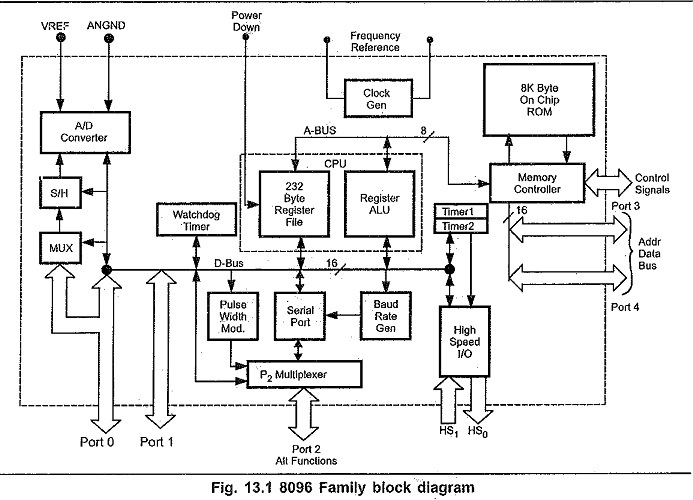 Programmable high speed I/O unit. In addition to these functional units, there are some sections which support overall operation of the chip such as the clock generator and baud rate generator. Two mainbuses (A-bus and D-bus) are used for inter-processor communication. A-bus is a 8-bit address bus and D-bus is a 16-bit data bus. The D-bus transfers data only between the RALU and the register file or special function registers (SFRs). The A-bus provides the addresses for above transfers or address for multiplexed address/data bus connecting to the memory controller. The memory controller provides the addresses for the internal ROM and external memory.